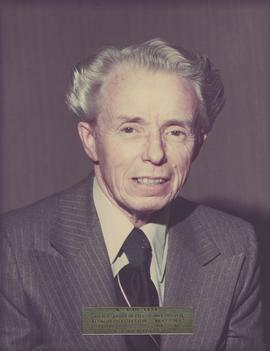 Photograph shows William Ballard, former Secretary-Treasurer of the City of West Kildonan, 1915-1952. Photograph of the 999 Call Centre when it was located in the Public Safety Building. Mayor's Office stamp on verso. Date of photograph is approximate, ca. 1965. Photograph possibly shows Jas. Yuill of the Fire Brigade. Date of photograph is probable, [1884?]. Detached from Water Works Scrapbook, page unknown. A photograph of Water Works employee. This black and white photograph shows a woman standing in front of City Hall (back side of building). Date of photograph is approximate, [ca. 1917]. Detached from Water Works Scrapbook, page unknown. A photograph of Water Works employees. This black and white photograph shows four men sitting around a small wooden table. Date of photograph is approximate, [ca. 1920].